You can simultaneously work on any number of websites or properties. Your only limit is the number of properties you have in your Google Search Console account. Select either all, multiple or a single property from the drop-down list. Selecting all or multiple properties will allow you to work with aggregate data for the selected properties. This is especially useful if you use, for example, both http and https versions of your website, several subdomains, or host important pages on external domains. Just like with websites or properties, you can work with any number of pages. 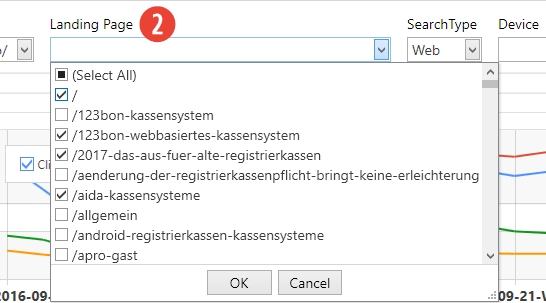 Simply select from the drop-down list All, multiple pages or just one. 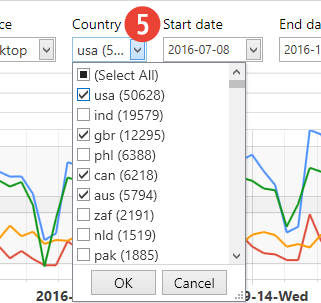 Search Console Helper will fetch the data matching your selection. Finding a single page among hundreds or thousands of pages is a breeze in Search Console Helper. 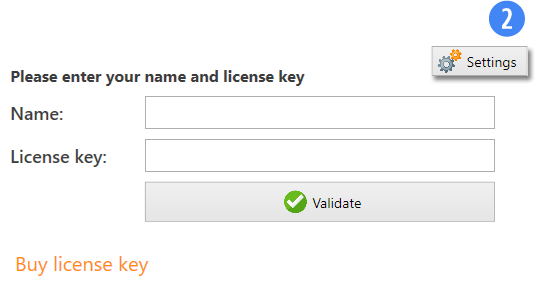 Simply, enter part of the URL into the Landing page box and hit Enter. Our handy search function will immediately return the list of pages containing your text. 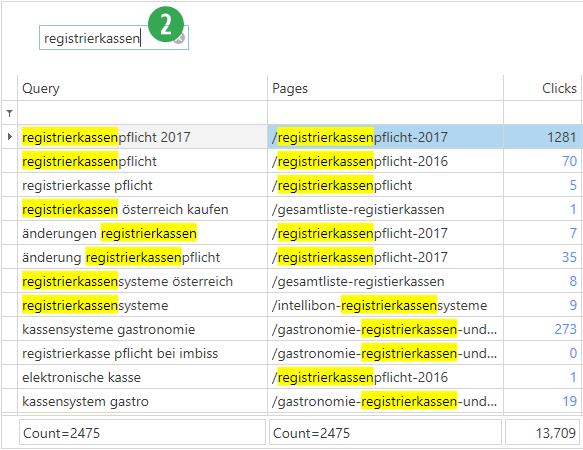 For example, if you are looking for all pages that contain the keyword “registrierkassen” in the URL, type “registrierkassen” and hit Enter. You will get a list of only those pages that contain your keyword. You can fetch data for 3 different search types: Web, Images and Video. This information gives you a better understanding of where your search traffic originated. Web indicates that the search was performed in the classic Google Search. Images and Video indicate that the searches originated in the Google Search for Images and Video, respectively. As usual, Search Console Helper allows you to fetch data for all search types or just for some. Your choice. 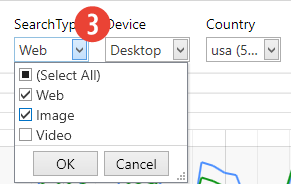 You can fetch separate data for searches from 3 types of devices: Desktop, Mobile and Tablet. This information allows you to see what type of device are your visitors using. It also allows you to compare results from different devices. Naturally, you are able to fetch data for all devices, just one or any combination of the three. If your target audience is located in multiple countries, you need to be able to see how each country or language is performing. With data fetched for 200 different countries and your ability to view information for all, some or only one country, geographical analysis of your website’s performance is a breeze. Changing the start date for the desired period is as easy as clicking a button and navigating to the desired date. A familiar calendar view, complete with names of the week days, makes this task super-easy. 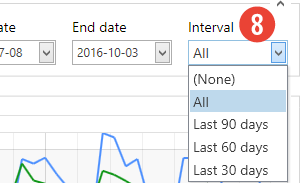 Extending or shortening the period for which you wish to fetch the data is just as easy as moving the start date. 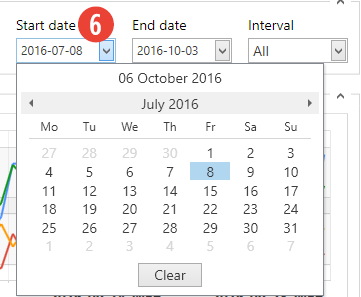 Simply click on the box and navigate to the desired date in a beautiful calendar view. 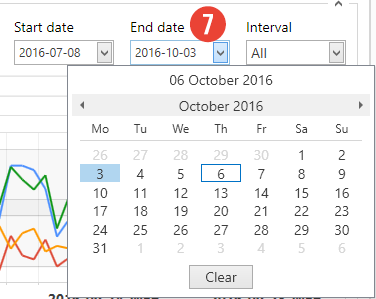 The last date feature allows you to select a pre-defined time period with 1 click of a mouse. 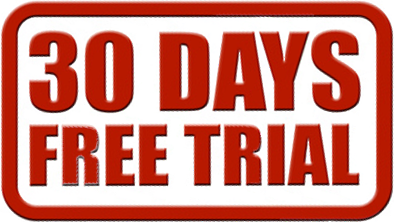 Currently available periods are: Last 30, 60 and 90 days, and All time, which automatically fetches data for all days. 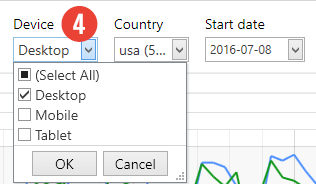 So, whether you forgot, when you started using Search Console Helper or you need a quick way to fetch all data, this option is your best friend. Regardless of what data you are viewing, the four key indicators are always prominently visible. Clicks tells you how many people clicked on your search results in Google. Impressions tells you how many people saw your result in Google Search. CTR stands for click-through rate and tells you how many percent of people who saw your result in Google Search also click on it. 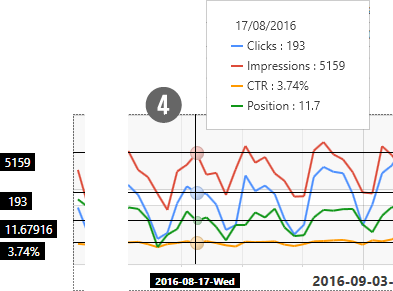 Finally, Position gives you an average ranking position in Google Search. This data comes straight from Google, so there is no more accurate source of information. You can switch between the daily, weekly or monthly view simply by pushing a button. This feature allows you spot trends that would otherwise become invisible to you. For example, you might not be able to tell right away, just looking at your daily fluctuations, if your results are getting better over time or not. Switching to weekly or monthly view reveals this information right away. Daily view, on the other hand, allows you to spot short-term anomalies, which might get lost in aggregate data. The chart displays the position of all key indicators over the chosen period of time. You can easily turn individual indicators on or off by checking and unchecking their box. This allows you to view either the performance of individual indicators or to compare the performance of sets of indicators over time. Whenever you hover over the chart, you will see detailed information for that given day. As you move your cursor to the next day, the information automatically changes to reflect your new position in the chart. This is very useful for a quick day-on-day comparison or to follow trends. You can view every data set in an easy-to-follow tabulated form. Depending on the level of data that you have fetched, you will see the following columns: Query, Pages, Clicks, Impressions, CTR, Position, Search Type, Devices and Countries. You are completely in control about the order of columns in your data set. If you wish to move any one column, simply drag it to its new place. This allows you to view the information exactly the way you want it. The search box on top of the data set provides you a super-easy way to find either a search query or a landing page, based on a string of text. Simply type in anything in the search box and the see then results immediately in the data set, with updated data AND the string text highlighted. This is very useful if you are looking for a particular keyword or page, or if you are getting ready to filter the data set based on additional criteria. This helpful function will add a date column to the data by simply checking a box. Doing so, will break down each record further by date by adding a separate row for each day and record. This granular view gives you another view dimension and allows you to easily spot any historical anomalies or possible future trends in your data. Do you need to show some data to your “SEO guy”? 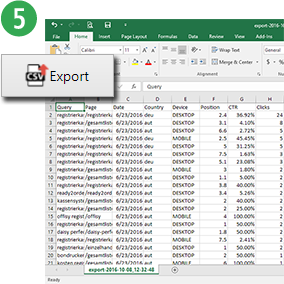 Simply export your current view into an Excel spreadsheet and email it to her/him. No Microsoft Excel? No problem. 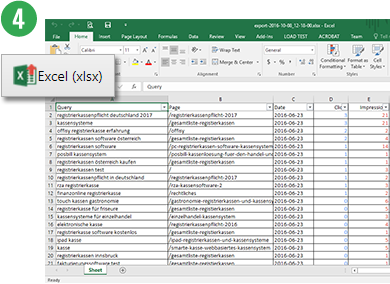 Simply export your data into a CSV (“comma-separated values”) file, which can be imported into all popular programs that work with tabulated data. Basically, all spreadsheets and database management systems support this type of file. So, all your bases are covered. 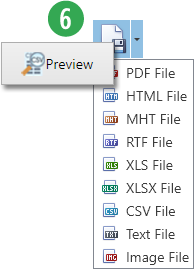 If, by any chance, Excel or CVS file export wouldn’t be sufficient, the Preview panel allows you to save your data set in 7 additional file formats, including: HTML, MHT, RTF, XLS, Text and Image. This gives you a full control over how you share your date with others. 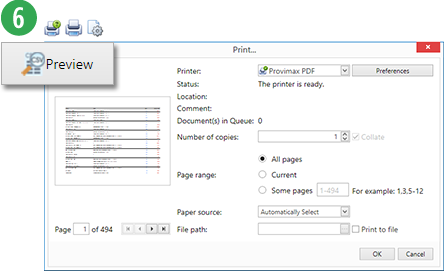 The Preview function also allows you to send your data to the printer and get a physical paper printout just in case you want to take a second look or make written notes about your thoughts. Just as it is easy to export data from Search Console Helper, it is as easy (if not easier) to import data from somewhere else. All you need is the CSV file. This function allows you to give another person your data, or a sub-set of it, without giving them access to your Google Search Console. They will simply import your data into their own Search Console Helper and work with it without any need to connect to your Google Search Console. This means full functionality with zero security and data-leak risk. You can type anything into the top row of any column and the data will be automatically filtered according to what you typed. 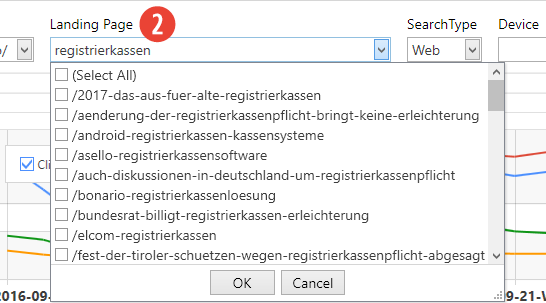 For example, when you type “registrierkassen” into the Query column, you will see only keywords that contain the word “registrierkassen”. When you then type “2017” into the Pages column, the previously filtered results will be further narrowed down to those pages that contain “2017” in their URL. This is a super-fast way to drill down into the data and laser-focus on exactly what you want. Right-clicking inside the data set will display a menu, which allows you to filter the data by the complete keyword and/or URL. This is not only another way to filter data, but it’s also the best way to view data related to any Query or Page. If, for any reason, you want to see where your keyword is currently ranking in the actual Google results, simply right-click the keyword and then select Search keyword in Google. You can choose between regular (personalized to you) search or anonymous. 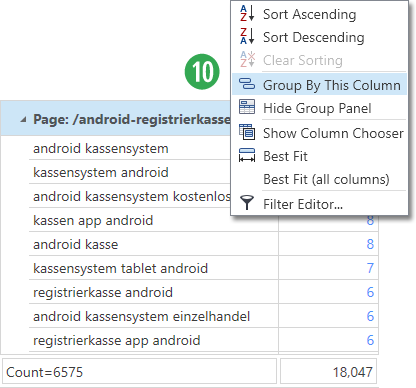 You can sort the data in either ascending (A-Z, smallest to largest) or descending (Z-A, largest to smallest) order by either right-clicking the column header and selecting the desired order or by left-clicking it. The data will be immediately sorted. 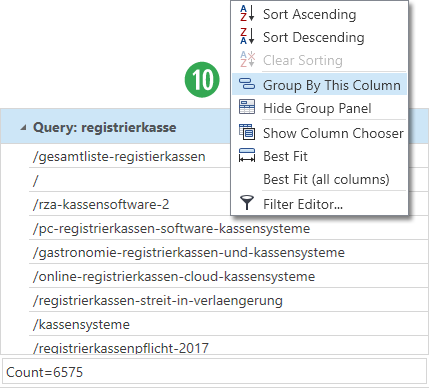 You can see all pages that are ranking for any given keyword by right-clicking on the Query column header and selecting Group By This Column. Your data will be immediately re-grouped under individual keywords. You can then view the list of pages by clicking the keyword. This function is especially useful when you are trying to analyze traffic cannibalization. You can see all keywords that any given page comes up in Google Search results by right-clicking on the Pages column header and selecting Group By This Column. Your data will be immediately re-grouped on a per-page basis. You can then view the keyword list by clicking the page’s name. This function is especially useful when you are optimizing pages and looking for new traffic opportunities. You can choose to view any column you like, depending on your needs and desires. 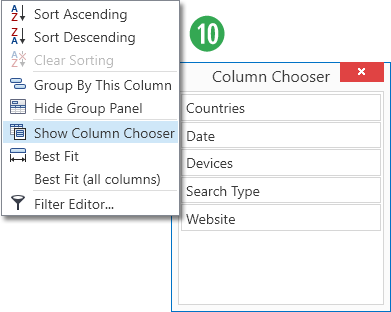 Simply right-click on the column header, select Show Column Chooser and drag-and-drop any number of columns into any place in the data set. Whenever you are using the filtering function, you can click the icon in the bottom right corner to enter the Filter Editor. 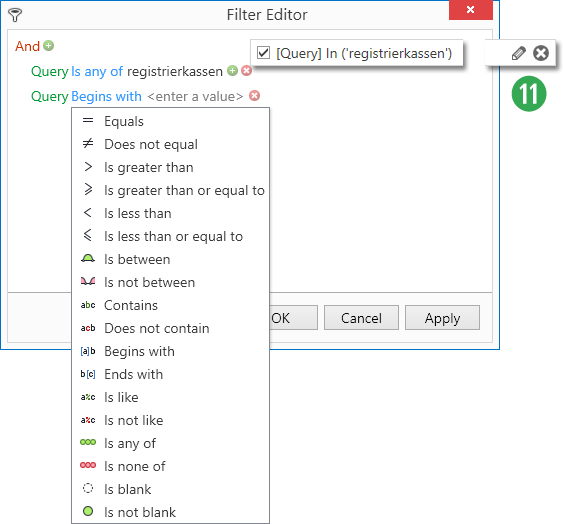 It allows you do some really complex filtering based on as many conditions as you need. 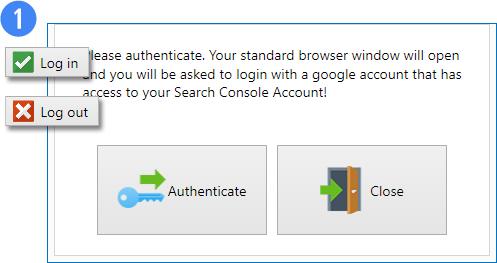 The Login/Logout button allows you to disconnect from your current Google Search Console account and log in with another account — without loosing any data! This is really useful for agencies and businesses working with multiple Google Accounts. 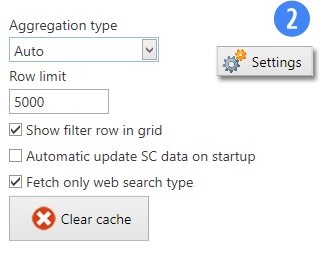 If for some reason, you wish to change the number of rows to be fetched from Google pre request, or whether data should be fetched automatically upon starting up Search Console Helper, and some other settings, you are free to do so in the first panel of the Settings area. 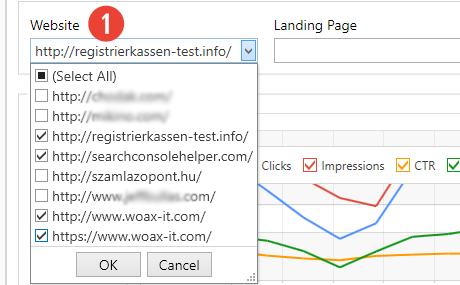 Search Console Helper currently comes in three language versions: English, German and Hungarian. Do you have troubles reading small type on a screen? Or, perhaps, you wish to fit more data on your screen? 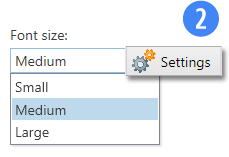 You can change the default font size in the Themes area of the Settings section. 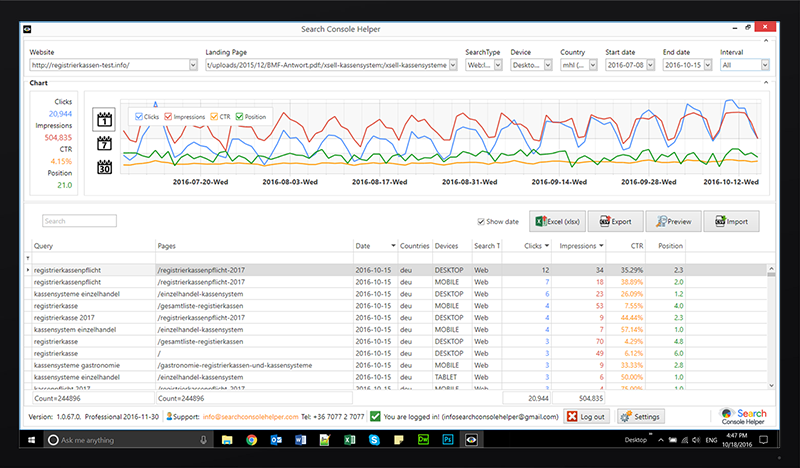 Pick any of the six different themes and instantly modify the look and feel of Search Console Helper. You can do so from within the Themes area of the Settings section. Program updates normally happen automatically, when you launch Search Console Helper. You can also update your version or backup your data manually in the Settings section. 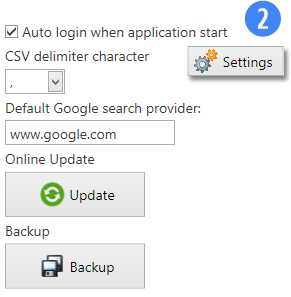 Search Console Helper comes with already pre-installed (our own) Google Client ID. This means that you can start fetching data from Google right away, without needing to do any additional tasks. However, this also means that you are sharing the same Google API with other Search Console Helper users, who use the default settings. 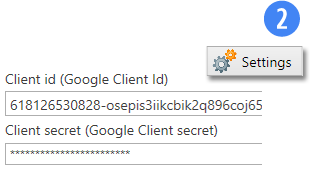 Entering your own Google Client ID allows you to fetch data independently. This is especially useful, when you have a very large site and need to do lot of data fetching. And, of course, you can best benefit from Search Console Helper by upgrading to the Professional version. No matter what your questions are, we are always ready to answer them and help you profit from Search Console Helper any way we can. You can reach us via email or phone. We’re always here for you!